NanoWorld Pointprobe® FM probes are designed for force modulation mode imaging. The force constant of the FM type fills the gap between contact and non-contact probes. 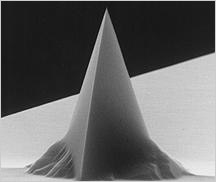 Furthermore non-contact or tapping mode imaging is possible with this AFM probe.